Cauliflower prefers a well drained, fertile soil high in organic matter with a consistent supply of moisture throughout the season. Water regularly for best results. 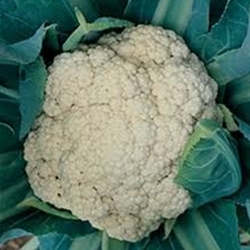 Cauliflower prefers cooler temperatures and should be planted in the spring or fall. Available in a four pack. All plants are certified organic. Select here for transplant information, pick up and order dates. Long season variety for fall harvests. Sturdy plants produce dense, milky white heads. Partial self wrapping heads easily separate into tender, uniform florets.